Our monetization platform features a fully developed integration with Knovio. Our platform supports integration with many popular online video platforms. One of these platforms is Knovio. By integrating your Knovio and InPlayer accounts, you will be able to quickly and easily monetize all your Knovio videos, as well as track the payment analytics straight from your Knovio account. 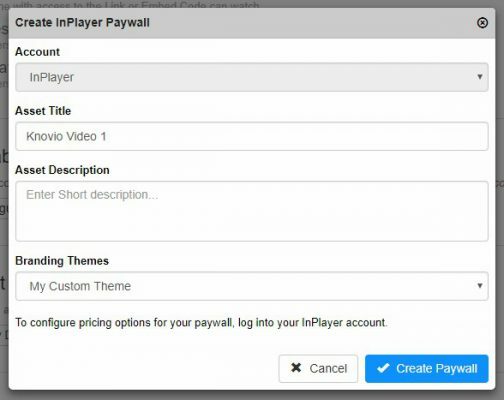 At the moment, the InPlayer paywall can be used for individual Knovio videos. Knovio Showcase support is coming soon as well, but for the time being you will need to contact Knovio’s Support team if you wish to use this feature. Let’s take a look at how everything works. To integrate your InPlayer and Knovio accounts you will be taking advantage of our OAuth & SSO feature. Log into your InPlayer dashboard, open your account settings menu and under Settings, go to OAuth & SSO. 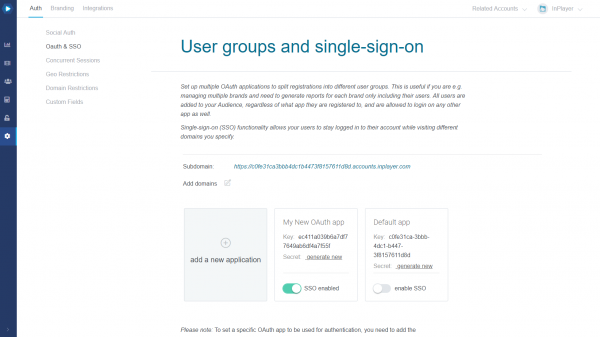 Add a new OAuth app by clicking on add a new application. Give your new app a name (Knovio for example) and click . 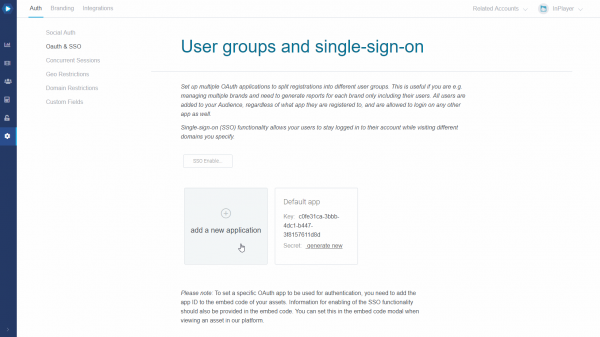 Once you create your new OAuth app, you will need it’s Key and Secret. The Key will be shown in the app box, but you will have to generate a new Secret. To do this, click on generate new¸ and confirm by clicking on . Your secret will be displayed in a new window. Copy the secret key by clicking on and keep it somewhere safe. Note that once you close this window, you will not be able to see the secret ever again and if you happen to lose it or if its compromised, you will have to generate a new one. 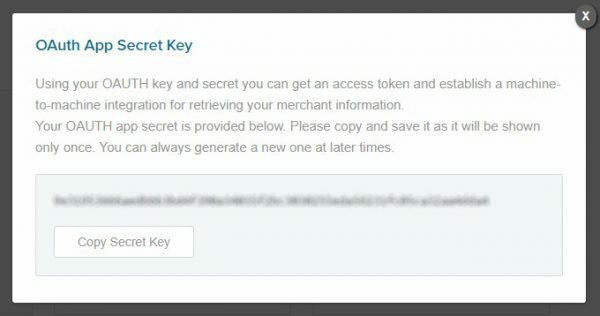 Once you have your Secret and your Key, send them over to Knovio’s support on support@knowledgevision.com, asking them to enable the paywall solution on your Knovio account. Once they do, you can start monetizing your content. Once you get the confirmation from Knovio’s support team that the paywall feature has been enabled, you can start using it on your videos. To do this, log into your Knovio account and go to your list of videos in the Manage tab. On the video you wish to monetize, click Share, and scroll down to the Sharing Settings section. In the Sharing Settings, choose InPlayer Paywall. In the new window, enter the Title and Description that will appear on the paywall screen in front of the video, and select the InPlayer Branding Theme (if you have one set up). Next, you will need to set up the pricing for your video. To do this, click on the button. Here, you can set up your asset’s details. In the Name field at the top, enter a name for your asset. In the Add Description block, set up the preview image, title and description, as well as the text for the BUY button. These will be the details that will appear on the actual asset preview when you embed it on your webpage. 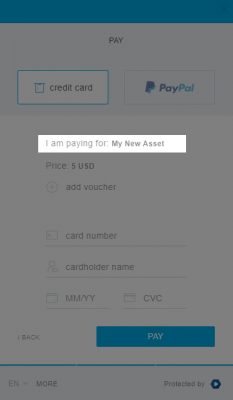 Note that the Title will also appear on the final payment form on the paywall, as well as the notification emails your customers will receive. In the Price Options block, set up the pricing. In the Access Fee Description field, enter the price description that will appear on the paywall. ppv custom is a one-time payment pass that expires on a specified date. In the Price field, enter the price. In the Currency field, select the currency. The The Asset block will already be filled out, so you don’t have to change anything there. 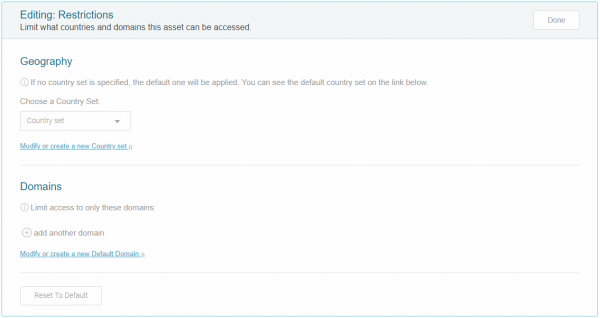 In the Restrictions block, set up any geographic or domain-based restrictions for the asset. You can learn more about setting up the restrictions here and here. When you’re done, click the button at the top right. And with that, your video is ready for monetization. Go back to your Knovio account, go to the Manage tab and then to the video’s Share settings, and get the embed code or the link for the video. You can then embed your video on your page or share the link to it and start selling!